The science is clear. The only way we can prevent a climate catastrophe, is to keep fossil fuels in the ground. Today an unprecedented gathering of hundreds of every day people from all over Australia are meeting at the gateway of Australia’s carbon export to the world to draw a red line under the age of fossil fuels. Our message is clear: it’s time to break free from destruction and make way for a clean energy future. Break Free From Fossil Fuels is a two-week global wave of escalated action to keep coal, oil + gas in the ground. 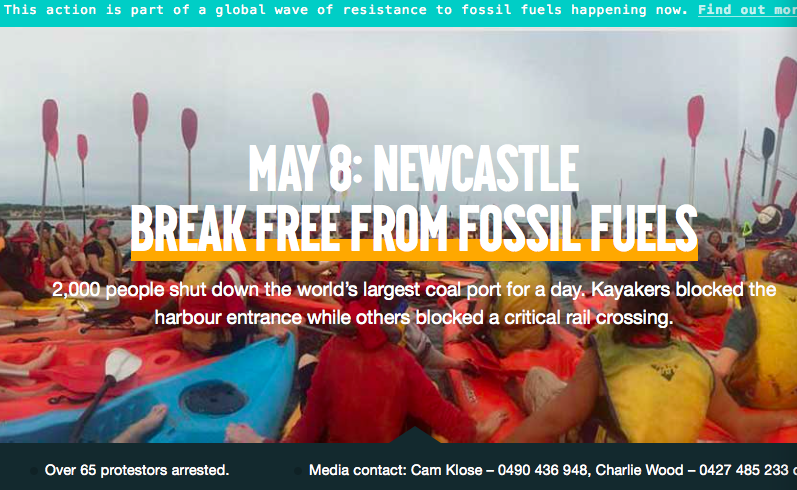 This entry was posted in Events local and tagged breakfree2016, civil disobedience, climate change, coal, Newcastle. Bookmark the permalink.